Cabinet Surplus Sale! Cabinets as low as $25! From now through March 31, 2017, you can save on 11 popular Zodiaq® colors! From light and airy to bold and rich, these 11 colors allow you to utilize a popular range of the palette from DuPont™ Zodiaq® quartz surfaces – all at a price that will delight. This limited time offering is exclusive to the following colors; Astral Pearl, Borealis Blue, Caraway, Coarse Pepper, Dove Grey, Graphite, Lunar Pearl, Snow Flurry, Snowdrift, Storm Grey and Stratus White. A GREAT opportunity for a dramatic make-over at a great savings. *Savings are on the sink only and do not include fabrication or installation. No matter what style, there is a color and/or pattern of DuPont™ Corian® solid surface to suit your kitchen and bath design! You can enjoy GREAT savings on 27 stylish colors that have everyday appeal. Sandstone, Silver Gray – and pay group A pricing. Concrete, Flint, Granola, Seafoam – and pay group B pricing. Earth, Elderberry, Jasmine, Lava Rock, Milky Way, Natural Gray, Rain Cloud, Saffron, Sandalwood, Tumbleweed, Witch Hazel – and pay group C pricing. 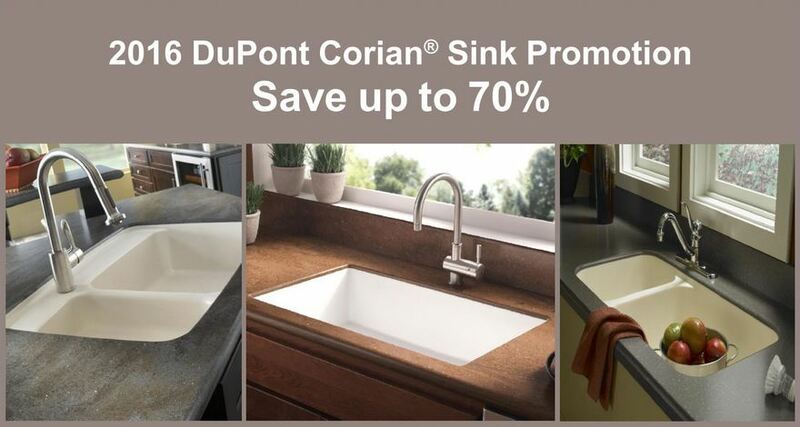 Click here to download the promotion flyer or contact your participating Corian® retailer for promotional pricing. 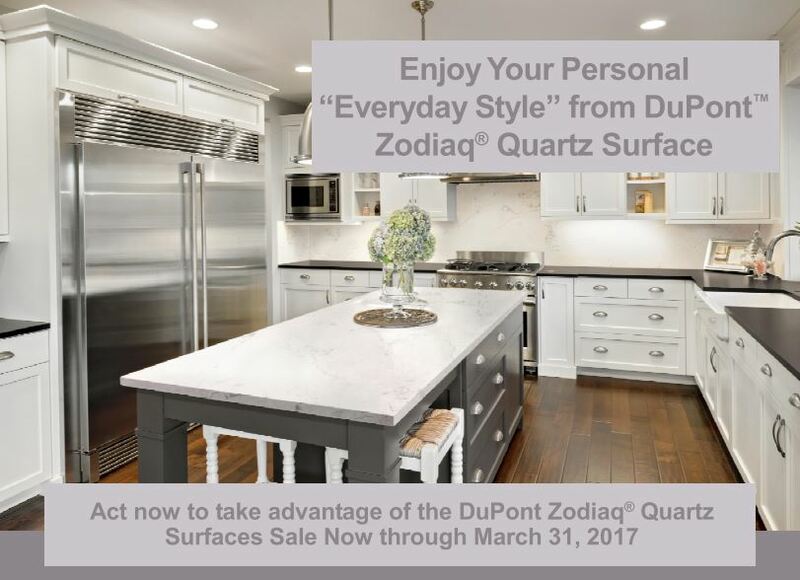 Create your own “Peaceful Retreat” with DuPont Zodiaq® Quartz Surfaces and save up to 15%! Available now through December 31st, 2015. We all could use a relaxing and serene place to escape the hustle of our everyday lives. Let the palette of DuPont™ Zodiaq® quartz surface whisk you away to a Peaceful Retreat, filled with soothing greys, warm and inviting tans, and ethereal whites. This limited time offering is exclusive to the following colors; Caraway, Coarse Pepper, Lunar Pearl, Snow Flurry, Storm Grey, and some of our newest colors, Dove Grey, Graphite, Snowdrift, and Stratus White. Flowing, virtually seamless, organic shapes, bold effects of color and translucency — if it can be imagined, it can be created with DuPont™ Corian® solid surface. Corian® is available in a vast range of trendsetting patterns and tones for kitchens, baths and beyond. Corian® solid surfaces deliver high performance and outstanding aesthetics. A signature DuPont innovation, Corian® solid surfaces continue to evolve and to inspire unprecedented creative flights of design fancy, combined with functionality. 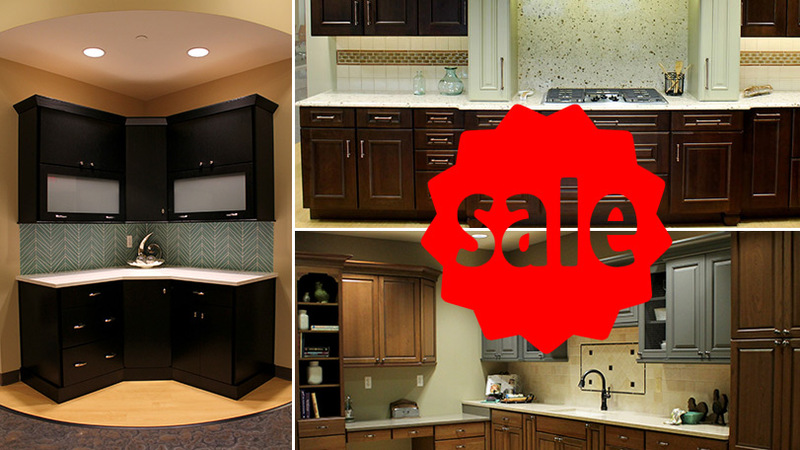 The “NEXT Phase of Style” Countertop Sale! • Soothing, Indulgent, Energizing…24 Great Corian® Colors all available at GREAT prices. Click here for details and the promotional flyer. See your Authorized Corian® retailer today! 22 Great Colors all available at GREAT prices! Corian® Essentials Sale –9 of our best selling colors at a price that will make you smile! Promotion available through March 28, 2014. See your Authorized Corian® retailer today! Now through December 31, 2012, consumers may receive a “free”* model 871 or 872 sink with the purchase of 35 sq. ft. or more of qualifying Corian® countertops. Sink upgrades are available too! Consumers can upgrade to sink models 850, 873, 874 or 881 for only $120. If you prefer the crisp, contemporary look of the newest Vaso 966 sink, you can upgrade to that model for only $329*. Use our Retailer Locator tool to find a participating retailer near you and get started on your project today! Offer valid on “B through E” series sheet colors only. *Does not include sink installation fee.